We are lying motionless on the ground, wrestling with the ancient struggle of letting go. Yoga Instructor Cori Lassahn recently founded Vineyard Yoga SYV, which pairs the ancient art with local wines. 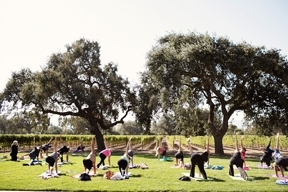 Pictured, a flexible group enjoys a peaceful class at Roblar Winery in Santa Ynez last month. Our group—which consists of about 20 women and a few men—are surrounded by the lush vineyards of Roblar Winery on a dewy, October morning in Santa Ynez. The swish of leaves and the chirp of birdsong have replaced the incessant buzz of text messages, swoosh of emails, and clamor of inner to-do lists. We are present; we are living the moment. We are ready to sip wine. Yes, you heard me right. While some might suggest a bit of dry cracker to cleanse the pallet, Lassahn has a far groovier concept in mind. Her new business, Vineyard Yoga Santa Ynez Valley, “preps” the tasters’ experience by first inviting them to stretch, kneel, and breathe for an hour-long yoga session. The classes unfold at bucolic winery settings and are paired with fine wine, gourmet food, and—as is the case for a Feb. 15 Valentine’s class—artisanal chocolate. Sound a tad hippy dippy for your taste? Studies do show that outdoor exercise can lead to a happier headspace, and if you ask me, taking the leap from positive outlook to heightened pleasure while sipping—say—a really well-crafted bottle of pinot noir, isn’t crazy at all. Lassahn cited an environmental science and technology group study spanning 11 research studies on 833 subjects. The 13-year yoga veteran personally knows how a few minutes per day of downward dog and child’s pose can lighten one’s mental and physical load. In 1998, the then-recent college grad took a Bay Area yoga class on a lark. With a background in dance and a stressful corporate day job eating away at her insides, something clicked. She found her calling. Pair that feel-good feeling with tantalizing tastes, and you have a recipe for pure, unadulterated pleasure. Although some readers will undoubtedly balk at the idea of pairing any kind of physical exercise with alcohol, I say bring it on. I was more than thrilled to attend Lassahn’s very first session, paired with butternut squash soup, baby kale, flourless chocolate cake, and tastes of Roblar’s 2012 Central Coast Chardonnay, 2011 Pinot Noir Arroyo Seco, and 2011 Grassetto. My personal verdict? The experience was a heavenly (if not incredibly indulgent) way to spend a Sunday morning. I did feel more at ease during the tasting, too. Lassahn started up Vineyard Yoga SYV only a few months ago, executing the idea with her signature mix of persistence and positivity. As owner of wedding/event planning business Avante Events, Lassahn has what we in the business call “serious networking skills,” and the business prowess to match. “I see all of these gorgeous winery properties every day, and I thought it would be so neat to present something where we could be healthy, breathe in the fresh air, and enjoy the gorgeous views,” she said. Being a teacher first and foremost means ensuring that each class moves at an accessible pace (this largely depends on who shows up). Advanced yoga enthusiasts, beginners, and shy first-timers are always welcome to try their hand at the ancient practice. Students sign a waiver and are warned to listen to what their bodies are telling them. The hardest part for this writer? One: Keeping my clammy hands from slipping all over the mat. Strengthen your balance—and your palate—at SYV’s upcoming classes, slated for Nov. 15 at Kalyra Winery ($19), Dec. 7 at Coquelicot Winery Courtyard ($25), Dec. 13 at Kalyra Winery ($19), Jan. 10 at Kalyra Winery ($19), and Feb. 15 at Firestone Winery, which includes a special Valentine’s Day chocolate tasting ($45). For tickets and information: vineyardyogasyv.com. And two: Literally willing myself not to take copious notes between poses. Even I know that this would be counteproductive. Somewhere between the initial breathing exercises and a position that managed to twist my legs, arms, and hands into a sort of a pretzel (amazing for opening up the shoulder blades and hips), I sunk into a true dream-like trance. My mind channeled the essence of a purring cat, content to simply stretch and bask blissfully in the sun. How much did the anticipation of delicious wine add to this experience? I couldn’t tell you. That fact is unique to my own personal voyage. 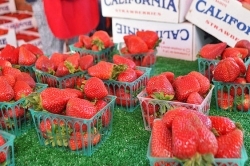 Hayley Thomas, food writer for New Times San Luis Obispo and new Santa Maria Sun recruit, is finding her center at hthomas@newtimesslo.com.